Hello there, friend. How are you? I have some great lit news to share, but first, some personal updates. I've been home in Pittsburgh in my parents' home, the house I grew up in, staying in my old bedroom. I've been here since the 19th and it has been a fantastic visit. Sal was here until yesterday, but had to head home for work tomorrow. We had a whopping 21 people for Thanksgiving and my 13-year-old nephew is now 5'10" which is just bizarre. I've spent time with family and friends and my heart is filled with some East Coast love. Gratitude: I haz it. Lots. I've also been able to work from Pittsburgh since ModCloth has a Pittsburgh office. I've been working on the anthologies for my Poetry Inside Out residencies and reading Weave submissions. Now that I've made progress on all of that, I took some time to read blogs, check my G+ literary circles, and sort through emails. Here's a list of shiny (and one not-so-shiny), recent, and some not-so-recent, literary nuggets that caught my attention. First up - journals you might want to submit to! (ending with a preposition is OK!) qarrtsiluni, Radioactive Moat, and my poet-friend Mary Stone Dockery (also a Weave 07 contributor!) is guest editing The Medulla Review. Interesting reads: Ursula K. Le Guin weighs in on the 99% with a fantastical story. Teresa Petro poems about machinery and arts and crafts. Writing tools for poets and prose writers alike! Check out 14 Punctuation Marks That You Never Knew Existed (I'm a fan of the exclamation comma). I really want these in a poem of mine. I love punctuation so much. Also, if you need a good starting place for a character in your next flash piece or person poem, check out this handy list of archetypes. I also like using Wikipedia for this. I thought about listing some AWP news about panels and off-site readings, but I've decided to devote an entire post to that topic. If you read my blog and you are on a panel and/or reading at AWP, let me know. I'd like to prioritize those events if I can! And I'd like to create some kind of awesome flowchart of prioritization about AWP. Read this fantastic article from Sampsonia Way Magazine. Burmese children share their thoughts on why freedom of speech is important. 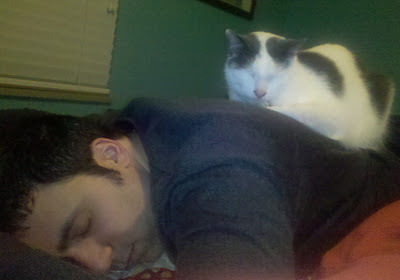 I leave you with an adorable picture of Sal and Domino taking a nap. It makes me happy. "Women who love to write poetry are the hagfish of the world. We eat everything. We eat the language. We eat experience. We eat other people’s poems." --Ruth Stone. OK -- that's an amazing line!!! Thanks for sharing :) The source? If you aren't too busy, that is. I did a quick google, but no luck. I'm thinking of Baba Yaga and the Skeleton Lady! Happy Thanksgiving by the way... I'm certainly grateful for this blog and your "nuggets!" I'm in the process of searching for a new female, grandmother, old crone literary persona to fill my final days of fall. Ruth Stone is new to me -- I will check her out! Thanks for the link!